Stephen Carroll Gostkowski (/ɡɒstˈkaʊski/ gost-KOW-skee;[a] born January 28, 1984) is an American football placekicker for the New England Patriots of the National Football League (NFL). He was drafted by the Patriots in the fourth round of the 2006 NFL Draft. One of just two kickers drafted, Gostkowski was the only rookie kicker to make an NFL roster that year. He has won three Super Bowls with the Patriots. Gostkowski, who played both college football and baseball for the University of Memphis, is the most accurate kicker in Patriots history, and, as of the end of the 2018 season, the third-most accurate kicker in NFL history. He is also a consistent and prolific scorer: he is only the second player in NFL history to score 500 points in his first four seasons in the league, and the first to score 1,000 points in his first eight seasons in the league (despite missing half the 2010 season with a leg injury). Gostkowski also holds the record for highest average points per game scored over a career (8.75 points per game as of the end of the 2015 season), and is the first player since the AFL-NFL merger to lead the league in scoring in more than two consecutive seasons (2012–2015; he also led the league in scoring in 2008). In 2014, he became the Patriots' all-time leading scorer, surpassing Adam Vinatieri. As of 2016, he is also the Patriots' all-time leader in field goals, and holds the NFL record for consecutive extra points with 479 (523 including postseason). Gostkowski graduated from Madison Central High School in Madison, Mississippi, in 2002. While there, he won four varsity letters each in football and soccer, and three in baseball, and was an All-State honoree in all three sports. Gostkowski holds the school record for longest field goal, a 55-yard kick. His teammates at Madison Central included current 49ers executive Parys Haralson and former Titans center Chris Spencer. His opponents included former Atlanta Falcons running back Benjamin Skiest, who returned one of Gostkowski's kickoffs from two yards deep in the end zone; Gostkowski raced Skiest down at the 25-yard line to prevent a touchdown. His most common nickname growing up was "Beaver"; he lost two front teeth playing hockey and had fake teeth that were too large put in as replacements. While at Memphis, he was dubbed "Gotti" by Tigers head coach Tommy West, because West could not pronounce Gostkowski correctly. Gostkowski attended the University of Memphis, where he played for the Memphis Tigers football team and majored in exercise and sports science. Gostkowski received an athletic scholarship to play baseball for Memphis, and was a walk-on for the football team. He finished his college career with a total of 369 points, a school record, and 13th overall in NCAA Division I-A history, converting 70 of 92 field goals and 159 of 165 extra points (PATs) during his Tiger career. His 70 field goals and 159 extra points both set school records previously held by Joe Allison (1990–1993). He earned first team All-Conference USA honors in both his junior and senior years and was named Conference USA's Special Teams Player of the Year in 2005. Gostkowski was drafted by the New England Patriots in the fourth round of the 2006 NFL Draft with the 118th overall pick. He was the first of two placekickers to be selected that year. During the Patriots' 2006 training camp, he competed with veteran kicker Martín Gramática, who the Patriots had signed as a free agent after Adam Vinatieri signed with the Indianapolis Colts. On August 23, 2006, before their third preseason game, the Patriots cut Gramática, and gave the job to rookie Gostkowski. Since Gramática's release, Gostkowski has not faced any competition for his job. During the 2006 preseason, Gostkowski was perfect on field goals and extra points, going 9-for-9 and 11-for-11, respectively, for a total of 38 points. His longest field goal was a 54-yard attempt against the New York Giants in the last preseason game. On November 26, 2006, Gostkowski made the longest regular-season kick of his young career, a 52-yard kick against the Chicago Bears, which is also the longest kick ever made at Gillette Stadium. Gostkowski finished the 2006 season as the highest-scoring rookie, with 103 points (20 field goals and 43 extra points), edging out the 96 points scored by Jacksonville running back Maurice Jones-Drew. While Gostkowski struggled early in his rookie season—he had two consecutive kicks blocked—his kickoffs were noticeably longer than were Vinatieri's in his last season in Foxborough. During the 2006 season, he averaged 65.5 yards per kickoff with a return average of 23 yards, and a total of 12 touchbacks. (By comparison, in 2005, Vinatieri's average kickoff was just 61.6 yards, though playing in a dome in 2006 he averaged 65.8 yards.) Gostkowski also outperformed opposing teams on field goals: Gostkowski made 20 of 26 kicks (76.9%), while opposing kickers made just 22 of 30 (73.3%). Gostkowski's rookie season was statistically about the same as Vinatieri's: Vinatieri converted 27 of 35 kicks (77.3%), but missed three extra points (39/42). In Week 17, he missed an extra point attempt for the first time in his NFL career. Gostkowski also had to contend with having three different holders during the season. After his first holder, punter Josh Miller, was placed on injured reserve after Week 11, the Patriots signed Ken Walter, who held for Weeks 12 to 15 until he was placed on injured reserve. Though the Patriots hired Todd Sauerbrun to punt, holding duties were given to the Patriots' backup quarterback Matt Cassel (which led to one regular-season kick that, while good, made two bizarre turns in mid-air). In the Wild Card Round of the 2006 postseason against the New York Jets, Gostkowski was perfect on all his kick attempts, converting three field goal attempts (from 20, 40, and 28 yards) and four extra points. He also had one kickoff go through the back of the end zone (over 80 yards) for a touchback. In the AFC Championship, Gostkowski again converted all of his kicks (two field goals and four extra points), and recorded two touchbacks on kickoffs against the Indianapolis Colts. Although Gostkowski ranked 30th in field goal attempts through the first 12 weeks of the NFL season (16 attempts, 14 converted), he managed to equal his entire 2006 scoring output in those 12 weeks, thanks to an NFL-leading 61 extra point attempts, all of which he converted. In Week 15, against the New York Jets, Gostkowski broke former Miami Dolphins kicker Uwe von Schamann's record for most extra points converted in a season, with his 67th successful attempt. In Week 16, against the Miami Dolphins, Gostkowski broke von Schamann's record of 70 extra point attempts. Gostkowski finished the season a perfect 74-for-74 on extra points, eclipsing Jeff Wilkins' 1999 record of 64-for-64 with the St. Louis Rams. (These PAT records were surpassed by Denver Broncos kicker Matt Prater in 2013.) Gostkowski also went 21 for 24 on field goals to finish with 137 points on the season, the third-highest total of any player that year (rookie Green Bay kicker Mason Crosby had 141, and Patriots receiver Randy Moss had 138). Gostkowski had two field goal attempts in the postseason, both in the Divisional Round against the Jacksonville Jaguars; Gostkowski converted one, but missed the other, his only failed postseason conversion. He was 9-for-9 on his extra point attempts. In the AFC Championship victory over the San Diego Chargers, he converted all three extra point attempts. In Super Bowl XLII against the New York Giants, he converted both extra point attempts in the 17–14 loss. Gostkowski was a key contributor in the Patriots' 19–10 win over the New York Jets in Week 2, the game that marked Matt Cassel's debut as a starter after a season-ending injury to Tom Brady. Gostkowski converted four field goals from 21, 37, 28, and 27 yards, and recorded touchbacks on the first five of his six kickoffs (the last kick was returned to the 20 before a Raymond Ventrone tackle). In October, Gostkowski, after going 9-for-10 on field goals and 11-for-11 on extra points for a team-high 38 points, was named AFC Special Teams Player of the Month for the first time in his career. In Week 16, Gostkowski had the highest-scoring game of his NFL career, converting four field goal attempts and five extra point attempts against the Arizona Cardinals. The 17-point performance gave him a total of 34 field goals on the season, breaking Tony Franklin's 1986 franchise record of 32, and 141 points scored, tying Vinatieri's post-merger franchise record, with one game still to play. (Former wide receiver/kicker Gino Cappelletti scored 155 points for the Patriots in 1964, and 147 points in 1961, but those include 44 and 56 points on receptions.) Gostkowski finished the season with a league-leading 148 points, the 13th-highest single-season total in NFL history; his 36 field goals converted is the sixth-best total, and the most since Neil Rackers made 40 in 2005. Gostkowski kicks off in October 2009. In Week 16, after scoring a field goal against the Miami Dolphins to make the score 17–3 in favor of Miami, Gostkowski made a tackle of Clyde Gates on the subsequent kickoff that was credited as "pivotal" in the Patriots' comeback victory. Instead of allowing a touchdown, Gostkowski tackled Gates at the Miami 38. Miami lost the ball on the ensuing possession, and the Patriots went on to score a touchdown of their own, closing the deficit to 17–10 en route to a 27–24 win. In the 2012 season, Gostkowski converted all 66 extra point attempts and 29-of-35 field goal attempts. In Week 11, in the 59–24 victory over the Indianapolis Colts, he tied his career high, with eight extra points converted to go along with a 31-yard field goal. With 153 total points scored, he won the scoring title for the 2012 season. Gostkowski finished the season with an NFL-leading 35 field goals out of 37 attempts (94.6%, a career-high). He was honored with his third Pro Bowl selection and was selected as a Second-Team All-Pro (behind Vinatieri). Gostkowski won his first Super Bowl ring when the Patriots defeated the Seattle Seahawks by a score of 28–24. He did not kick any field goals but made four extra points. In a Week 3 victory over the Jacksonville Jaguars, Gostkowski recorded his 423rd consecutive extra point, breaking Matt Stover's record of 422. For the first three weeks, he converted all 14 extra point attempts and all seven field goal attempts, and was named AFC Special Teams Player of the Month for the third time in his career. During the Patriots' Week 5 game at AT&T Stadium versus the Dallas Cowboys, Gostkowski tied Vinatieri's franchise record kicking a 57-yard field goal to end the first half. Through the first five games of the season, Gostkowski was 12-for-12 on field goals and 21-for-21 on extra points. He added three more field goals on three tries in a 30–23 win over the New York Jets in Week 7 to start his season 15-for-15. Against the Miami Dolphins in a 36–7 win on October 29, he was four-for-four on extra points and two-for-two on field goals, including a 52-yarder. Against the New York Giants on November 15, with only one second remaining, he kicked the game-winning 54 yard field goal to get the 27–26 win, with the Patriots staying undefeated at 9–0 on the season. Additionally, he surpassed Adam Vinatieri on the Patriots' all-time leader in field goals. With the performance against the Giants, Gostkowski improved to 21-of-21 field goals made and 34-of-34 extra points made for the season. In week 11, in a 20-13 win over the Buffalo Bills, Gostkowski missed a 54-yard field goal attempt; it was his first miss since November 30, 2014, and his first miss at home since Week 2 of the 2013 season. He finished the season with 151 points, marking the fourth consecutive season he exceeded 150 points; no other player in NFL history has scored 150 points more than once. In the AFC Championship Game against the Denver Broncos, Gostkowski missed his first extra point since 2006 and only the second of his career, ending a streak of 523 consecutive successful attempts. After the Patriots were defeated 20-18 following a failed two-point conversion near the end of the game, Gostkowski blamed himself for the loss. However, Gostkowski, who also scored two field goals during the game, was defended by Patriots coach Bill Belichick and teammates Julian Edelman, Logan Ryan, Tom Brady, Rob Gronkowski, Danny Amendola, and Malcolm Butler. It was also his first miss in 56 attempts since the NFL moved the spot for extra points from the 2-yard line back to the 15-yard line. During the 2016 offseason, the NFL changed the rule on kickoffs so that touchbacks would grant the offense an extra five yards, with possessions starting at the 25-yard line rather than the 20-yard line. The Patriots took advantage of Gostkowski's ability to deliver "mortar kicks" that have a long hang time but land inside the field of play, which then forces the opposing team to attempt to return the kick. In the Patriots' Week 1 upset of the Arizona Cardinals, the Patriots used such a kick to force the Cardinals to start their final drive, which ended in a missed field goal, at their own eight-yard line. While against the Houston Texans in Week 3, the Patriots forced two fumbles on such kickoffs. He earned Special Teams Player of the Week in Week 13 for making all four field goal attempts including three over 45 yards and converted two extra points. Gostkowski became the first placekicker in Super Bowl history to start at placekicker for the winning team without kicking an extra point. In Super Bowl LI, Gostkowski missed the extra point on the Patriots' first touchdown, the Patriots successfully attempted two-point conversions on their second and third touchdowns, and the Patriots' final, game-winning touchdown came in overtime, so no extra point was needed. In the 34–28 overtime victory over the Atlanta Falcons, Gostkowski hit on a 41-yard attempt in the second quarter and a 33-yard attempt in the fourth quarter. In Week 4 during a 33-30 loss against the Carolina Panthers, Gostkowski set a new franchise record by making a 58-yard field goal, beating the 57-yard record he shared with Adam Vinatieri. He broke that record in the Patriots' Week 11 game against the Oakland Raiders at Estadio Azteca in Mexico City, kicking a 62-yard field goal as time expired in the first half. That kick was tied for the sixth-longest field goal in NFL history. In that game, Gostkowski booted four field goals, earning him AFC Special Teams Player of the Week. Gostkowski played in Super Bowl LII tying the record with former Patriot Adam Vinatieri to appear in five Super Bowls as a kicker. The Patriots failed to repeat as Super Bowl Champions after losing 41-33 to the Philadelphia Eagles. In the Super Bowl, Gostkowski missed a field goal and an extra point in the second quarter. Gostkowski finished sixth in the league among kickers with 130 points scored. He also set a record for most Super Bowl appearances by a kicker, at six, breaking his tie with former Patriot Adam Vinatieri. In Super Bowl LIII against the Los Angeles Rams, Gostkowski missed a field goal and made two during the Patriots win over the Rams. He kicked a 41-yard field goal with under two minutes left in the game to give the Patriots a 13-3 lead, essentially sealing the Super Bowl win for the Patriots. On April 9, 2019, Gostkowski re-signed with the Patriots on a two-year, $8.5 million deal. Accurate as of the end of the 2018 season. Stephen and his wife Hallie met when they were both in College at the University of Memphis, they were married in 2008. Hallie works as a Nurse at a Boston Hospital and the couple lives in Wrentham, Massachusetts with their sons Slayden and Gannon as well as a daughter, who was born in 2016. ^ Previous versions of Patriots' media guides gave the pronunciation as /ɡʌstˈaʊski/ gust-OW-skee, with the first k silent. ^ "New England Patriots Media Guide" (PDF). ^ "Patriots vs. Bengals media notes" (PDF). New England Patriots. October 1, 2007. Retrieved May 18, 2009. ^ "Pro Football Reference: Career Field Goal Percentage". Pro-Football Reference. Retrieved May 18, 2009. ^ "Patriots' Stephen Gostkowski misses extra point after making 523 in a row". CBS Sports. January 24, 2016. Retrieved January 11, 2018. ^ Perchick, Mike (January 19, 2015). "Super Bowl teams feature players with Mississippi ties". WAPT. Retrieved January 4, 2018. ^ Russell, Greg (Spring 2005). "Double Play". University of Memphis Magazine. Archived from the original on December 22, 2006. Retrieved February 11, 2007. ^ Laurila, David (June 23, 2008). "Kicking Around Some Baseball with Stephen Gostkowski". Baseball Prospectus. Retrieved July 1, 2008. ^ "Stephen Gostkowski College Stats". College Football at Sports-Reference.com. Retrieved January 4, 2018. ^ Reiss, Mike (May 10, 2006). "Tee time". Boston.com Reiss' Pieces. Retrieved January 5, 2007. ^ "2006 NFL Draft Listing". Pro-Football-Reference.com. Retrieved January 4, 2018. ^ August 23. "Patriots cut kicker Gramatica". CBC. Retrieved February 8, 2019. ^ "Chicago Bears at New England Patriots - November 26th, 2006". Pro-Football-Reference.com. Retrieved January 4, 2018. ^ "2006 NFL Scoring Summary". Pro-Football-Reference.com. Retrieved January 4, 2018. ^ "Stephen Gostkowski 2006 Game Log". Pro-Football-Reference.com. Retrieved December 16, 2017. ^ "Wild Card - New York Jets at New England Patriots - January 7th, 2007". Pro-Football-Reference.com. Retrieved January 4, 2018. ^ "Divisional Round - New England Patriots at San Diego Chargers - January 14th, 2007". Pro-Football-Reference.com. Retrieved January 4, 2018. ^ "AFC Championship - New England Patriots at Indianapolis Colts - January 21st, 2007". Pro-Football-Reference.com. Retrieved January 4, 2018. ^ Smith, Michael (January 4, 2007). "Gostkowski among kickers under the microscope". ESPN.com. Retrieved January 4, 2007. ^ "NFL Individual Records: Points After Touchdown". NFL.com. Retrieved December 29, 2007. ^ Brinson, Will (December 29, 2013). "Peyton Manning sets NFL record for passing yards in a season". CBS Sports. Retrieved December 29, 2013. ^ "2007 NFL Scoring Summary". Pro-Football-Reference.com. Retrieved January 4, 2018. ^ Reiss, Mike (December 5, 2007). "Kickoff situation". Boston.com. Retrieved December 14, 2009. ^ "Divisional Round - Jacksonville Jaguars at New England Patriots - January 12th, 2008". Pro-Football-Reference.com. Retrieved January 4, 2018. ^ "AFC Championship - San Diego Chargers at New England Patriots - January 20th, 2008". Pro-Football-Reference.com. Retrieved January 4, 2018. ^ "Super Bowl XLII - New York Giants vs. New England Patriots - February 3rd, 2008". Pro-Football-Reference.com. Retrieved January 4, 2018. ^ "New England Patriots at New York Jets - September 14th, 2008". Pro-Football-Reference.com. Retrieved January 4, 2018. ^ Reiss, Mike (October 30, 2008). "Gostkowski: AFC Special Teams Player of the Month". Boston.com Reiss' Pieces. Retrieved October 30, 2008. ^ "Arizona Cardinals at New England Patriots - December 21st, 2008". Pro-Football-Reference.com. Retrieved January 4, 2018. ^ "2008 NFL Scoring Summary". Pro-Football-Reference.com. Retrieved January 4, 2018. ^ Reiss, Mike (December 17, 2008). "Peers took a shining to stars". The Boston Globe. Retrieved May 18, 2009. ^ "2008 All-Pro team". NFL.com. Associated Press. Retrieved May 18, 2009. ^ Forsberg, Chris (September 15, 2009). "Postgame chatter". Boston.com Extra Points blog. Retrieved November 25, 2009. ^ Solomon, Jerome (July 29, 2006). "For kickers, time to replace the clutch". The Boston Globe. Retrieved November 25, 2009. ^ "Miami Dolphins at New England Patriots - November 8th, 2009". Pro-Football-Reference.com. Retrieved January 4, 2018. ^ "Stephen Gostkowski 2009 Game Log". Pro-Football-Reference.com. Retrieved January 4, 2018. ^ "Patriots kicker Stephen Gostkowski signs his RFA tender". Boston Herald. April 17, 2010. Retrieved September 6, 2010. ^ Reiss, Mike (August 26, 2010). "Source: Patriots kicker gets extension". ESPNBoston.com. Retrieved September 6, 2010. ^ "Baltimore Ravens at New England Patriots - October 17th, 2010". Pro-Football-Reference.com. Retrieved January 4, 2018. ^ "Stephen Gostkowski 2010 Game Log". Pro-Football-Reference.com. Retrieved January 4, 2018. ^ Gunn, Dave. "Former Kicker Koepplin Signed By Patriots". University of Massachusetts Athletics. Retrieved February 8, 2019. ^ Finn, Chad (December 24, 2011). "Gostkowski tackle proved important". The Boston Globe. ^ "Miami Dolphins at New England Patriots - December 24th, 2011". Pro-Football-Reference.com. Retrieved January 4, 2018. ^ "2011 NFL Scoring Summary". Pro-Football-Reference.com. Retrieved January 4, 2018. ^ "Stephen Gostkowski 2012 Game Log". Pro-Football-Reference.com. Retrieved January 4, 2018. ^ "Indianapolis Colts at New England Patriots - November 18th, 2012". Pro-Football-Reference.com. Retrieved January 4, 2018. ^ "2012 NFL Scoring Summary". Pro-Football-Reference.com. Retrieved January 4, 2018. ^ Patriots vs. Bills - Box Score - September 8, 2013 - ESPN. Espn.go.com. Retrieved on November 16, 2015. ^ Broncos vs. Patriots - Box Score - November 24, 2013 - ESPN. Espn.go.com. Retrieved on November 16, 2015. ^ Gostkowski breaks two Patriots franchise records | Comcast SportsNet Archived December 30, 2013, at Archive.today. CSNNE.com (December 29, 2013). Retrieved on November 16, 2015. ^ Colts vs. Patriots - Box Score - January 11, 2014 - ESPN. Scores.espn.go.com. Retrieved on November 16, 2015. ^ "Stephen Gostkowski added to Pro Bowl". ESPN.com. January 19, 2014. Retrieved February 8, 2019. ^ Peters, Micah (September 21, 2014). "'Kowski's score all of the points in Patriots-Raiders game". USAToday.com. Retrieved March 2, 2015. ^ "Stephen Gostkowski 2014 Game Log". Pro-Football-Reference.com. Retrieved January 4, 2018. ^ "Super Bowl XLIX - Seattle Seahawks vs. New England Patriots - February 1st, 2015". Pro-Football-Reference.com. Retrieved December 7, 2017. ^ "New England Patriots at Dallas Cowboys - October 11th, 2015". Pro-Football-Reference.com. Retrieved January 4, 2018. ^ New England Patriots 2015 Statistics – Team and Player Stats – ESPN. Espn.go.com. Retrieved on November 16, 2015. ^ "New York Jets at New England Patriots - October 25th, 2015". Pro-Football-Reference.com. Retrieved January 4, 2018. ^ Miami at New England | 2015-10-29 | National Football League | Yahoo! Sports. Sports.yahoo.com. Retrieved on November 16, 2015. ^ Patriots vs. Giants – Game Recap – November 15, 2015 – ESPN. Espn.go.com (January 1, 2015). Retrieved on November 16, 2015. ^ "Stephen Gostkowski - New England Patriots - National Football League - Yahoo! Sports". Yahoo Sports. ^ "NFL Single-Season Points Scored Leaders | Pro-Football-Reference.com". Pro-Football-Reference.com. Retrieved January 4, 2016. ^ "Seven Patriots selected to NFL Pro Bowl squad". New England Patriots. Retrieved December 23, 2015. ^ "Patriots K Stephen Gostkowski on PAT miss: 'I lost the game for the team'". Sports Illustrated. Retrieved January 27, 2016. ^ "Bill Belichick, Julian Edelman back Stephen Gostkowski despite costly miss". Boston.com. Retrieved January 27, 2016. ^ "Stephen Gostkowski says he 'lost the game' for Patriots, but his teammates disagree". SB Nation. Retrieved January 27, 2016. ^ Farley, Glen. "Patriots' Gostkowski still kickin'". The Enterprise, Brockton, MA. Retrieved February 8, 2019. ^ "New England Patriots at Arizona Cardinals - September 11th, 2016". Pro-Football-Reference.com. Retrieved January 4, 2018. ^ "The Patriots are making a mockery of the NFL's new kickoff rule". Retrieved September 25, 2016. ^ Press, Associated. "Patriots Pull Away From Steelers". courant.com. Retrieved January 6, 2017. ^ "NFL Stats: by Player Category". www.nfl.com. Retrieved January 6, 2017. ^ "Stephen Gostkowski appears in Pepsi's latest commercial". January 4, 2017. ^ Wire, The Patriots (October 1, 2017). "Stephen Gostkowski scores a new career long and franchise record 58 yard field goal as Patriots head into overtime trailing by 1". @Patriots_Wire. Retrieved October 1, 2017. ^ "New England Patriots at Oakland Raiders - November 19th, 2017". Pro-Football-Reference.com. Retrieved January 4, 2018. ^ Lam, Quang M. (November 22, 2017). "Antonio Brown, Mark Ingram among Players of Week". NFL.com. ^ "Stephen Gostkowski 2017 Game Log". Pro-Football-Reference.com. Retrieved January 4, 2018. ^ "Super Bowl LII - Philadelphia Eagles vs. New England Patriots - February 4th, 2018". Pro-Football-Reference.com. Retrieved February 8, 2019. ^ "2018 NFL Scoring Summary". Pro-Football-Reference.com. Retrieved February 8, 2019. ^ "Patriots kicker, Memphis alum Stephen Gostkowski will set Super Bowl record with sixth appearance". The Commercial Appeal. Retrieved February 8, 2019. ^ "Why Stephen Gostkowski was "weirdly calm" on Super Bowl-clinching kick". sports.yahoo.com. Retrieved February 8, 2019. ^ "Source: Pats retain Gostkowski with 2-year deal". ESPN.com. April 9, 2019. ^ "Stephen Gostkowski". Pro-football-reference. Retrieved November 18, 2015. 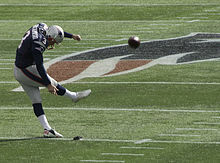 Wikimedia Commons has media related to Stephen Gostkowski.